The first time I came across this dish was in Femina Magazine several years ago. 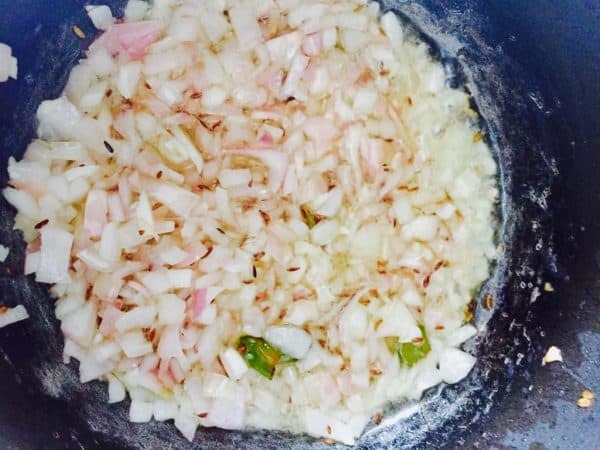 This was a recipe described by a celebrity and I learnt words such as bagar for the first time. 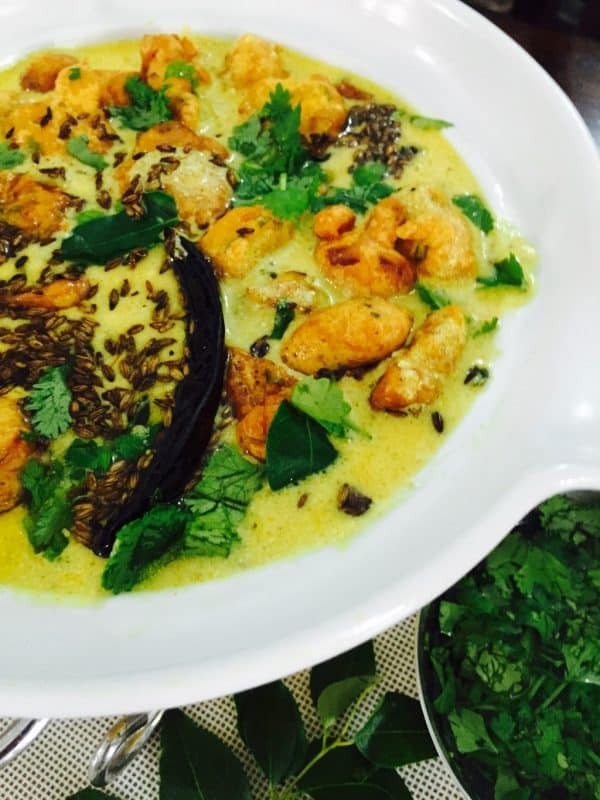 My recipe does not follow the one I read in the magazine, as that requires the bagar to be added to the kadhi in the end, while I actually add the curd basen mixture to the fried onions and condiments, and then do a ghee, jeera, mirch, tadka in the end . I use a lot of onions, and curd that is a day or two old. Finely chop the onions and mince the garlic, ginger, green chilli, curry leaves and cilantro as per the ingredients list for the kadhi, and set aside. Mince onion, ginger and cilantro, curry leaves for the pakode and set aside. Mix the salt, turmeric, cumin powder, chilli powder and baking soda into the gram flour, add water and whisk to make a soft batter. Add the minced onion, ginger, curry leaves and cilantro and mix well. The batter should not be very fluid as it needs to be shaped into pakodas. Drop spoonfuls of batter into hot oil and fry in batches. Drain the pakode and set aside till needed. Add the gram flour to the yogurt and whisk till its smooth. Add cumin powder, turmeric powder, chilli powder, pepper powder to the mixture and whisk again till all the ingredients are blended. Add water, and add salt to taste, and whisk. Heat 2 tbsps of oil in a large pan, sauté the cumin seeds for 10 secs. Add the chopped chilli and let them scald. Add onions and sauté till they are translucent, about 3 minutes, add the garlic and saute for 20 secs. Add the ginger and sauté for 10 secs. Pour the yogurt flour mixture into the pan. The yogurt may begin to bubble and splash, so keep the pan partially covered, except when stirring. 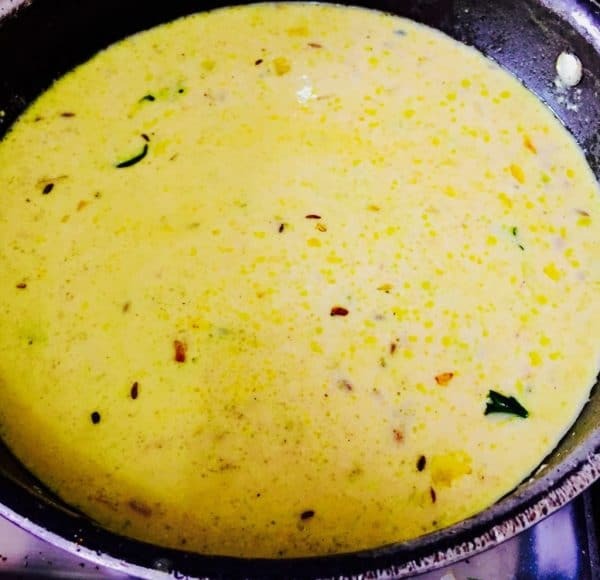 Keep the kadhi on low flame, stirring frequently as it can easily catch on the bottom of the pan and char. Cook the kadhi for 10 minutes. Temper with curry leaves, cumin seeds and a dry red chilli in hot ghee. Garnish with cilantro leaves. Add some more pakode just before serving so they do not become soggy. Serve hot with phulkas or with basmati rice. Yummm looking! That’s such a heart warming dish.